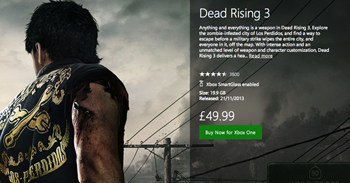 Games like Dead Rising 3 that were previously Â£44.99 are now Â£49.99 on the Xbox Games Store. Microsoft has increased the prices of Xbox One exclusives in the UK by Â£5 on the Xbox Games Store, making the digital versions of the exclusives more expensive than the physical copies. The company did not explain its decision. Speaking to Eurogamer, a Microsoft spokesperson said, "Pricing for select digital content in some markets has changed since launch." When the Xbox One launched in the region on Nov. 22, digital versions of Dead Rising 3, Ryse: Son of Rome, and Forza Motorsport 5 were Â£44.99. They are now Â£49.99. "Digital content pricing is subject to change and we may occasionally offer various deals or promotions," the spokesperson added. "Ultimately pricing and promotions will vary by region." No reason for the unannounced price increase was given. All Xbox One launch titles are $59.99 in the US. Consumers have been unhappy with the similar pricing structure of games from physical to digital, but a digital version costing more than a physical version is even stranger. Sony is also selling physical versions of PS4-exclusive games for a cheaper price than digital versions. Digital will have a hard time taking off as a standard if Microsoft and Sony sell physical copies of their games for cheaper prices than the digital versions. Of course, either way the prices for Xbox One and PS4 games are expensive.